Talk to me - what's this all about then? The clue's in the name, you see. Very funny. Anyway, Barrow's miles away from anywhere, isn't it? That's rather the point, isn't it? Anyway, one thing about Furness is that it's part of Lancashire - you know, home of the motorway. Of course, it's a detached part of the county, and you need to travel through Westmorland (or over the flats of Morecambe Bay) to reach it from the rest of Lancashire. So, in order to make communications between Furness and the rest of Lancashire better, James Drake and his team came up with this proposal. Not only that, but it also had the secondary benefit of allowing better access to the western part of the Lake District, so a double bonus. Construction of the M6 as far north as Kendal could result in far too much traffic entering the Lake District by the Kendal - Windermere but the Furness Link would encourage some of the traffic to enter via Newby Bridge. Also, industrial traffic now travelling to West Cumberland through the National Park could avoid it by using the Furness Link and the existing trunk road through Broughton. The road is first mentioned in 1949's Road Plan for Lancashire, as "Route 2", and is proposed to be an all-purpose route. From Route 1 [now M6] east of Carnforth to junction with A.6 - A motorway link to A.6 north of Keer Bridge. Thence to the Westmorland boundary. Follows the line of A.6 except for a diversion at Skew Bridge, Dockacres. In other words, the northern half of A601(M), plus an improved A6. The engineers then spent the 1950s thinking about it, and decided that it would probably be best if it ended up as a motorway after all - and not only that, but if it cut the corner across Morecambe Bay, so much the better. In 1963, when the proposal made it as far as the Ministry, it was estimated to cost £5,000,000 - but once again James Drake and company were ahead of his time. What did they come up with this time? Well, they came up with a brilliant idea - one that would be later reused. They reckoned that instead of £5,000,000, they could build the motorway for only £3,000,000, if that money would be better available. Like the later A6144(M) then? 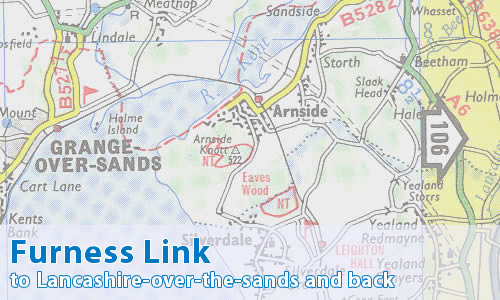 In 1967, Lancashire County Council placed the Furness Link on its top priority list of four road improvements. In 1970 an Inquiry onto the whole route was held, with the report getting back to the Ministry in February 1971. By this time, the road had lost its motorway status once more, and had reverted to the original all-purpose scheme. The Minister sat and thought, and sat and thought some more, before announcing the decision in December 1972 - to reject the road, although at a separate Inquiry a couple of years later, the Lindale Bypass that was supposed to connect to the Furness Link at its eastern end was given the go-ahead. The corpse has twitched ever since, with occasional questions being added as to the possibility of a barrage across Morecambe Bay carrying a road. One such occasion was in 1992 by the local MP, but there was no enthusiasm from the corridors of power.